Expression of Rab27a, Rab27b, and granuphilin in pancreatic islets. 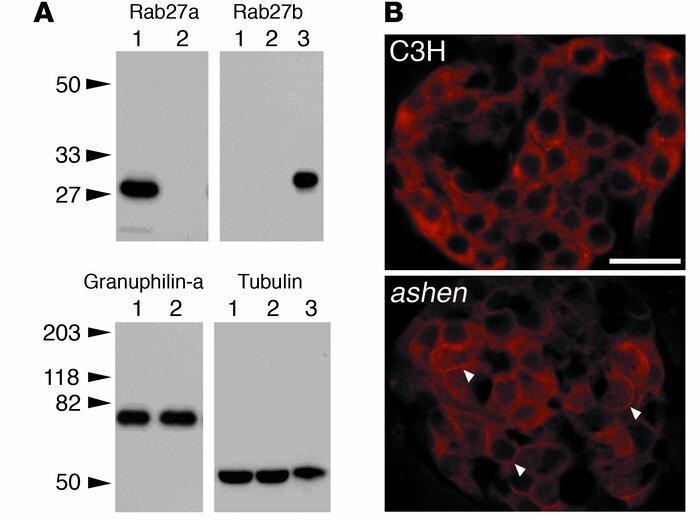 (A) An equal amount of protein (20 μg) from the pancreatic islets of 17-week-old male C3H/He (lane 1) and ashen mice (lane 2) was separated by electrophoresis for immunoblotting with anti-Rab27a, anti-Rab27b, or anti-granuphilin (αGrp-aC) antibodies. The expression levels of α-tubulin were also examined for normalization. For the immunoblotting with anti-Rab27b and anti–α-tubulin antibodies, 20 μg of protein from the pituitary of C3H/He mice were loaded on lane 3 for the reference. Numbers to the left of each panel are molecular masses in kDa. (B) The pancreas organs of 17-week-old male C3H/He (upper) or ashen mice (lower) were immunostained with anti-granuphilin antibodies (αGrp-N). Granuphilin is distinguishably concentrated along the plasma membrane in ashen β cells (arrowheads) compared with control β cells, although the expression levels are similar. Scale bar: 20 μm.